As noted in my last post, I just got back – last August 29 – from a trip that began on July 26. That’s when my brother and I started the drive from Utah to Whitehorse, Yukon Territory. Four days later – on Friday, July 29 – we met up with my nephew, fresh out of the Army. And so, here it is – drum roll please – my blog-post on the Chilkoot &$%# Trail! First of all, note the picture at the top of the page. It includes an easy-to-miss orange pole. (You see them marking the “trail.” The one in the photo above is to the hiker’s right – the viewer’s left – and “up the trail” a bit.) Note also: There doesn’t seem to be a “trail” anywhere around, either in the top photo or the ones below. Just one big pile of &$%# rocks after another. There’s more on those second and third days below. 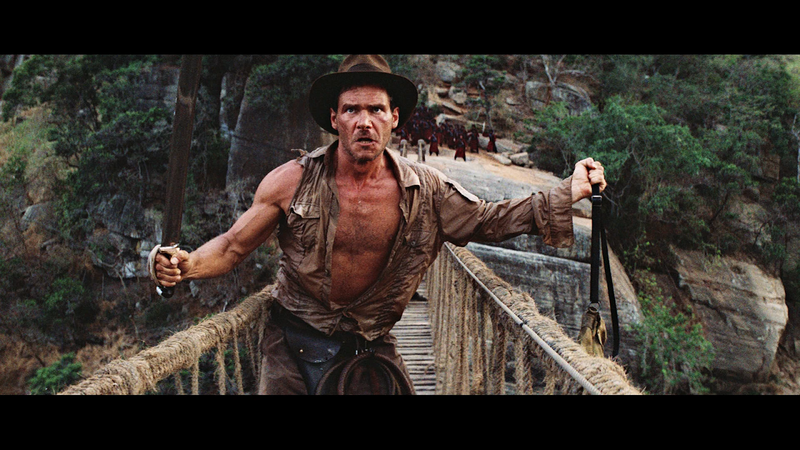 But on the first day we made Sheep Camp: “13 miles or so – nobody seems sure of the miles – by 7:30 p.m.” That included crossing the swaying footbridge, à la Indiana Jones and the Temple of Doom. (There’s a picture from the movie in the notes below.) There’s more on that in Part 2, but unfortunately, I’m now approaching the limit of the ideal length for a blog-post. (No more than 1,200 words. *) So, I’ll wrap up “Part 1” with a story relating to the photo below. We were approaching the summit of the Chilkoot Pass. (Slowly in general and especially slowly for me.) What with my lack of depth perception, going over “one big pile of *&$% rocks after another” was like negotiating a minefield. I wore heavy hiking boots, but they felt like ballet slippers. Every step was sheer torture, and brought new pain to each aching foot. One of many happy hikers who finished the Chilkoot Trail at Bennett, B.C. Unless otherwise noted, the images in this post – including the photos at the bottom and top of the page – are ones I took during the aforementioned “hike.” (More like sheer torture…) Also, an asterisk (“*”) in the main text indicates that a word or two of explanation will be made in these notes. For example, the “news flash” image is courtesy of www.dralionkennels.com/newsflash. Re: “One’s hell. The other’s damnation.” The quote is from The horror of the White Pass Trail | Yukon News. Also, “Dead Horse Trail” was also known as Dead Horse Gulch. The photo accompanying the paragraph is courtesy of the Yukon News. Re: Indiana Jones and the Temple of Doom. See also happyotter666.blogspot.com, which included the image at left, of a bridge like the one we crossed on the Chilkoot’s second day of hiking. Re: Ideal length of a blog-post. See How Long Should My Blog Posts Be? (Suggested length, 800-1,200 words.) But see also The Ideal Length for All Online Content – Buffer Blog, indicating a preferred post-length of 1,600 words. This entry was posted in Politics, Travelogs on September 7, 2016 by bbj1969per@aol.com.